Eduardo Rodriguez loses for only the second time this season as Seattle rolls to a 7-2 win. 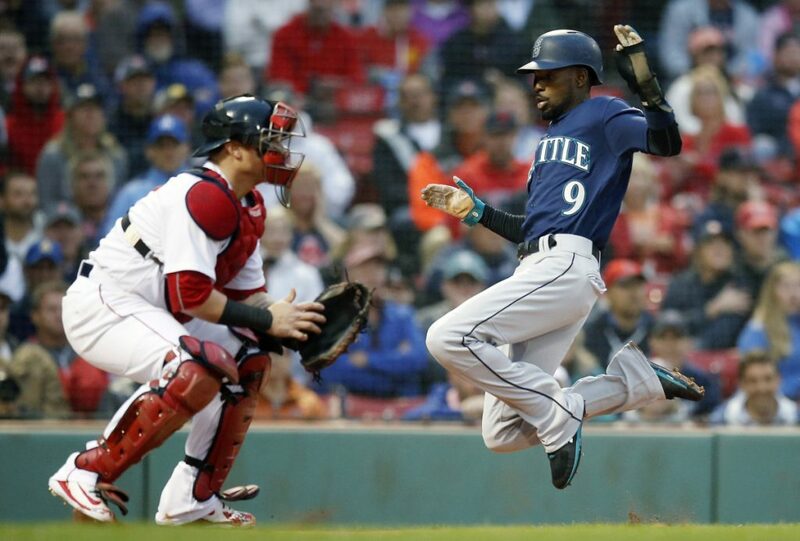 BOSTON — Mike Leake pitched eight shutout innings, Mitch Haniger drove in three runs and the Seattle Mariners snapped a season-high five-game losing streak with a 7-2 victory over the Boston Red Sox on Saturday night. Nelson Cruz had three hits and scored twice, a night after hitting two homers and driving in seven runs for Seattle, which went on its skid after beating Boston two straight at home last weekend. Leake (8-4) gave up three singles, struck out five and walked two, six days after he allowed five runs and took the loss against the Red Sox at Safeco Field. Edwin Diaz gave up two runs in the ninth. J.D. Martinez had two singles for Boston after going 4 for 5 with five RBI when the Red Sox collected a season-high 20 hits in a 14-10 victory Friday. Eduardo Rodriguez (9-2) gave up five runs, four earned, in four innings, snapping his six-game winning streak. The Red Sox were 13-1 in his starts this season. MARINERS: Shortstop Jean Segura missed his third straight game because of a right forearm infection. “The swelling has gone down quite a bit,” Manager Scott Servais said. The plan was for him to hit and field to see where he’d be for Sunday afternoon’s game. RED SOX: Manager Alex Cora said left-hander Drew Pomeranz (10-day DL, left biceps tendinitis) felt better after throwing off a mound on Friday. He threw lightly on Saturday and Cora said he “might do another bullpen” on Monday. … Third baseman Rafael Devers fouled a ball of his foot and came out after completing his at-bat. Cora said Betts was “a little bit under the weather. He had no energy.” The All-Star outfielder entered Saturday with a .342 average, second-best in the majors, with 19 homers and 39 RBI. Bogaerts left Friday’s game after he sprained his left index finger on a headfirst slide into second. For the second straight game, both starters had faced the same team in their previous start. Rodriguez earned the win last Sunday in Seattle, allowing only two runs in six innings. “It does make it a little bit more challenging for the pitcher, in my mind,” Servais said.